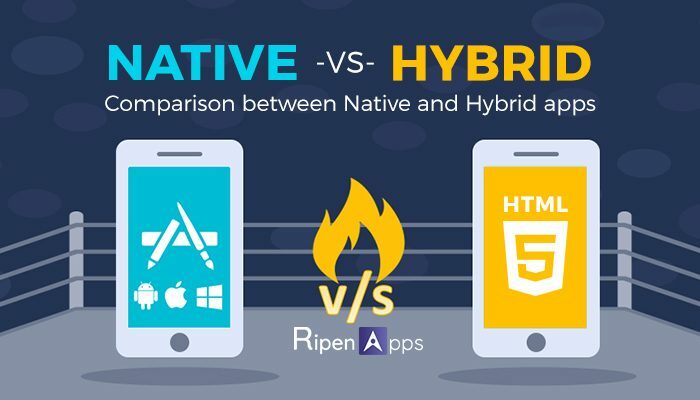 Since the inclusion of the concept of Hybrid app development, a debate is continually emerging that which one is optimal for mobile app development- Hybrid app development or Native app development. Well, if we look at the result from statista then- there was massive growth had been observed in the mobile app market since its inception until now. Statista says that the global mobile app market will be worth $190 billion in 2020, from $70 billion in 2015. 2017 reports state that Android & iOS, are the two frequently used operating systems for Smartphones, held a market share of 85% or 14.9% respectively. Until March 2018 counts prove that there were 3.8 million apps in Google Play (Android) and 2 million in Apple’s App Store (iOS). So, with which one you will go for your mobile app development idea, Native app development or will kill two birds with one stone by opting Hybrid mobile app development. Let’s have some information over native or hybrid app development with some advantages and disadvantage of both the platforms. Native app development- Development of the application for the specific platforms either iOS app development or Android know as Native App Development. Apply platform-specific languages develop the native app. Building Android apps include Java Kotlin and Python. For iOS mobile OS, the languages include Objective C and Swift. Let Us Have An Expeditious View On The Pros Of Native Apps. Since Native apps are platform specific, codes of native apps cherish direct access to the host’s operating system and functionalities. Simple & direct interaction with the native features of the app helps in enhancement of app’s performance, mainly when offering graphics & multimedia content. This will reduce the risk of downtimes from crashes or freezes. By integration with the mobile OS smoothly, Native apps provide a smooth interface to the users, so that they find easiness in navigating a familiar interface without bluffs & bugs. Due to high performance & easy to use features, Native apps hold a better position on App Store. It’s understood that creating apps for different platforms either (iOS or Android app development) can be a long or time taking process. The same code of an app cannot be deployed on another platform. It takes more time to rewrite the code for as well as makes more cost also. Developing app for single platform could be like you are missing opportunities of playing with different platforms and lacking to grab asserted revenue for your efforts. As the name portrays that, the app, which can run on various operating systems, that app known as a cross-platform app & the method of development known as cross-platform app development or Hybrid app development. It can be one approach for all destinations. “Write once, run everywhere” approach allows mobile app developers to reuse the same code on multiple platforms, will result in less cost & also saves a lot amount of time as well. It does not take too much knowledge of different programming languages to build the cross-platform mobile app, but requires a few masterstrokes to hit the goal. Since it takes few alterations in developing code for another platform, saves time as well as cost. Building cross-platform apps provide access to a broader range of target audience, which could lead you to the path of revenue generation. As compared to native apps, cross-platform apps do not integrate smoothly with their targeted platforms. Due to reusability of codes on various platforms, Apps may fail to offer robust user experience. Sometimes it is difficult to choose from Native & hybrid app development. Ultimately, you should opt the platform, which will fulfill your specific requirements.